Below are common attributes associated to Trumpet Vine. Become a care taker for Trumpet Vine! Below are member comments regarding how to plant Trumpet Vine. No comments have been posted regarding how to plant Trumpet Vine. Be the first! Do you know how to plant Trumpet Vine? Below are member comments regarding how to prune Trumpet Vine. No comments have been posted regarding how to prune Trumpet Vine. Be the first! Do you know how to prune Trumpet Vine? Below are member comments regarding how to fertilize Trumpet Vine. No comments have been posted regarding how to fertilize Trumpet Vine. Be the first! Do you know how to fertlize and water Trumpet Vine? Below are member comments regarding how to deal with Trumpet Vine's pests and problems. No comments have been posted regarding how to deal with Trumpet Vine's pests and problems. Be the first! Do you know how to deal with pests and problems with Trumpet Vine? Get Madame Galen Trumpet Vine fresh and large directly from the grower to your garden! 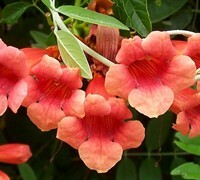 Buy Madame Galen Trumpet Vine online from the nursery wholesalers and save BIG! Cut back slightly in winter to ensure full blooms during the summer. Takes a couple of years to establish before it blooms, but well worth the wait! Very easy to propagate. Just dig up new shoots emerging during summer or fall from rhizome and transplant anywhere you want. Out of all the plants that attract hummingbirds in my landscape, Madame Galen Trumpet Vine is probably at or close to the top as the best. Unlike the native campsis that blooms for a short period of time, Madame Galen blooms from mid-summer well into fall here in mid-Georgia. This is a very fast-growing vine that, like wisteria, requires a large structure to grow on. Great for growing up tall poles, or the trunk of a large tree. Madame Galen Trumpet Vine is a very fast growing evergreen flowering vine that prefers growing in well-drained to well-drained moist soils and full sun to part shade. It can be useful in the landscape to climb larger structures such as arbors, fences, posts, poles, and even large trees. The vines are self-clinging to wood surfaces. The large, orange-red trumpet flowers produced from July through September are hummingbird magnets. To plant, dig a hole no deeper than the root ball and two to three times the width of the root ball and fill it with water. If the hole drains within a few hours, you have good drainage. If the water is still standing 12 hours later, improve the drainage in your bed, perhaps by establishing a raised mound. Turn and break up the soil removed from the planting hole. If the native soil is compacted, or heavy clay, amend with organic compost or a good soil amendment at a 50/50 ratio. This will help to condition the soil as well as hold moisture. Remove your plant from its container and carefully but firmly loosen the root ball. Set the plant into the hole you've prepared, making sure the top of the root ball is at or slightly above the soil level. Pull your backfill soil mixture around the root ball in the hole, tamping lightly as you go to remove air pockets. Water thoroughly and cover with a one to two-inch layer of mulch. Madame Galen Trumpet Vine does not require pruning however it can be clipped as needed to keep in bounds or to tidy it up. Madame Galen Trumpet vine does not require fertilization but to keep foliage greener you can fertilize it with a sloe-release plant food. I've seen no insect, pest or disease problems with Madame Galen Trumpet Vine. This plant can become invasive if not managed and will drop seeds that sprout all around the plant. Seedlings can be sprayed, removed or transplanted to other locations in the landscape. The minor management of this vine is well worth the effort as this is one of if not the best plants for attracting and feeding hummingbirds. Make sure to provide a large structure for this fast growing vine that grows to 20 feet or more in length. In other words, this is not a suitable vine for the mailbox. Arbors, sturdy fences and telephone poles are among the best supporters for this vine.